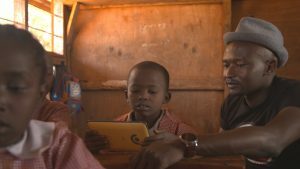 „Digital Africa“ is a multi-platform documentary project about digital innovations and modern technology made in Africa. It’s produced by Berlin based film production company berlin producers in cooperation with French-German TV ARTE and supported by GIZ, Heinrich-Böll-Stiftung, GIG, re:publica and others. 1) A DOCUMENTARY FILM (52‘) will be shown at the RE:PUBLICA in May and broadcasted on German – French TV ARTE in June. Starting from Berlin, GIG founder and re:publica curator Geraldine de Bastion goes on a journey through Kenya, Rwanda and Ghana to discover digital inventions and innovations, interview creators and pioneers, and experience the application fields of new developments. 2) THIS WEBPAGE as well as digitalafrica.online provide additional information to digital innovations in Africa, an interactive map and information on various projects. 3) A WEB-CLIP-SERIES presents six European challenges and six African inventions, that can give inspirations. 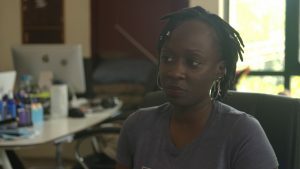 Animation artists Ebele Okoye (Germany/ Nigeria) and Shrinkfish (Nigeria) are “bringing” these inventions virtually to Europe. The series will be launched in parallel to the RE:PUBLICA 2.5.2018 on Arte Online. BRCK is a Kenyan hardware producer, who is about to innovate the African connectivity and education sector with solutions made in Africa. Founded in 2013, BRCK first started with the BRCK v1, a modem, that was made for areas with regular power shortages. Since then, the company built a whole digital world around the idea of connectivity. The BRCK v1 was succeeded by the SupaBRCK, a device which combines the modem, a server, a storage and much more. But most important is the idea of free WIFI and the new intranet platform “Moja”, that comes along with the SupaBRCK and intends to revolutionize the connectivity problem of the frontier markets of the global south. Another product that comes along with the SupaBRCK is the Kio Kit, an all-in-one classroom kit. It combines the modem with 40 pads and additional education content. BRCK is no doubt one of the big motors of digital hardware inventions in Africa. We met up with them to ask about the future of connectivity in Africa and the relationship of private and state engagement. Ushahidi, which means “testimony” in Swahili, is one of the most famous software solutions made in Kenya. Basically, it’s a map provider where everyone can add information to special maps, in order bundle geo information about particular events. 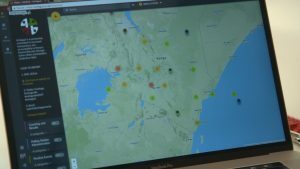 It was first developed in 2008 to monitor the Kenyan Elections, but soon became a global provider for crisis mapping and monitoring, as well as a project-specific map provider. An interesting part of Ushahidis work is their handling of the digital barrier in certain areas. During important crisis projects, Ushahidi works with its team and volunteers worldwide to transform SMS and Mails into Data for the map. This is an essential part of the map solution, because otherwise big parts of societies across the world would be excluded of the new, sometimes life-saving solution. In our Interview, Angela highlighted the importance of keeping such a software open source and her experience in a global tech family, that is working for good. AB3D is a unique 3D printer manufactory. It produces its printers out of printed parts and local electronic waste. Roy Ombatti, founder of the small company which tries to produce locally and sell globally, highlights the importance of the technology for the industrial revolution 4.0 and especially for a new competitive and agile entrepreneurship in Kenya. 3D printing, as it’s a prominent and controversial technology between an overpriced toy and an allround micro factory, has a special offer for a lot of African sectors, where spare parts are hard to get, because of the usage of old western technology. Now 3D Printing is able to reduce those costs of spare parts massively and it’s also able to produce cheap and easy prototypes or individual items, or even do small production lines. We spoke with Roy about the benefits of 3D printing, the problem of power shortages for his work and the importance of a “repair” mindset in Kenya. When Kamau Gachigi introduces Gearbox, he calls it “a factory of factories”. 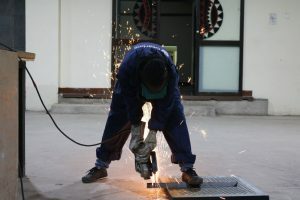 The number one makerspace of Nairobi works closely with the iHub and provides a hardware development space for young entrepreneurs, techies and engineers. Around this, it tries to build up a community of makers who can improve their technique, invent their own hardware and work for customers with individual orders. So far, the space is a place for advanced prototyping, but Kamau wants to build up a space for low scale production as well to realize the final version of his “factory of factories”. Kamau gave us a lesson about the relationship of international funding and local production culture. In his eyes, only a balance between international and local knowledge can solve the problems of today and lead to a more industrialized production site Kenya. 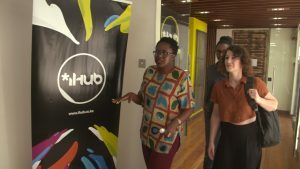 Founded in 2010, the iHub and its subcompany, the mLab, are probably the most famous tech institutions in Kenya and Sheila Birgen is one of its prominent masterminds called the “the Queen of mobile apps”. The Hub provides a co-working space with mentorship, business support services, workshops and events, and the possibility of venture funding through connections with the local and international venture capital community. It was the biggest motor for tech innovation so far and gave birth to the first well-known tech companies like Ushahidi, BRCK and many more. We spoke with Sheila about the change, that has undergone the hub and the tech scene as a whole in the recent past. According to her, even though she notes a big increase of local and international investments, the mindset of the young Kenyan tech entrepreneur stays focused to social challenges. 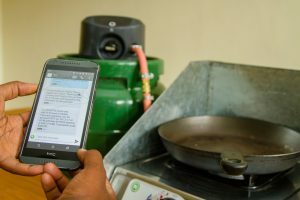 PayGo Energy was one of the babies of Gearbox and it’s becoming a grown-up tech solution, that provides clean gas to the most vulnerable settlements of Nairobi. The idea is to measure gas via IoT and so be able to provide a “pay n go” solution to people which normally couldn’t afford the clean alternative to charcoal or kerosene. With its solution, the company wants to revolutionize the way of cooking for more than 3 billion people and in this way also help to fight climate change. We spoke with Laura about the possibilities and challenges of frontier markets, and especially the vulnerable group of sometimes illegal settlers in big cities. “Charis Unmanned Arial Solutions” was founded in 2014 by Eric R and Teddy Segore. 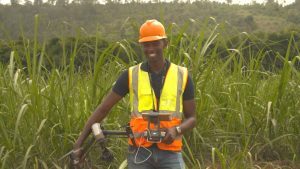 The company builds drones and works with them in different sectors, like agriculture, construction or journalism. 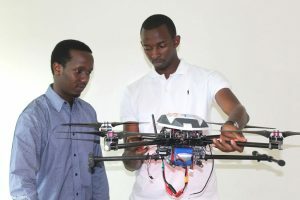 Even though drones are still a niche in Rwanda, the few government restrictions and a wide application spectrum give them a promising future. Drones have already been used for medical transportation to rural areas and crop mapping, a solution for farmers to monitor their fields and detect diseases, which has a massive impact for farmers everywhere in the world. We went with Teddy to the Rwandan countryside, assisted during a drone flight and joked about the position of drone pilots: They are maybe the new rockstars of the tech community across the world. kLab is a unique hub in the African tech landscape, because it’s mostly financed by the Rwandan Government as a part of their ICT development program, that intends to change Rwanda into a knowledge based economy until 2020. It’s comparable to the iHub and has given birth to a number of startups like SafeMoto, the AC Group, that has revolutionized the Kigali public transport payment system, or Mergims, a solution that connects the African Diaspora around the world with its relatives on the continent. Aphrodice told us about his dream of a whole “hub city” with its own independent infrastructure, from theater to hospital. He also emphasized the importance of the Rwandan government as a supporter of the local entrepreneurs and innovators. Safe Moto is a Kigali based private transport solution. Founded in 2014, the startup provides a franchise moto taxi service, that monitors, evaluates and rates its drivers safety skills and gives the user an opportunity to add a personal rate after the lift. So, SafeMoto can be seen as the digital answer to a huge problem of the city transport – the safety risk on the road. The solution is a perfect example for successful local ideas, that respond directly to local problems and don’t need to be cumbersome imposed by international companies. 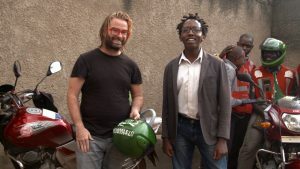 SafeMoto was our favorite way to explore Kigali and to get to our different interviewees. Peter told us about his first intention for the company and how to bring those intentions to a real product. 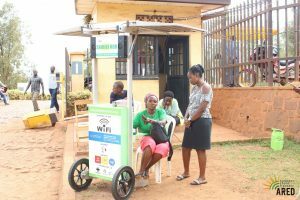 The “mobile solar kiosk” is a local solution to the pan African problem of long power shortages and rare power access in some, mostly rural areas. 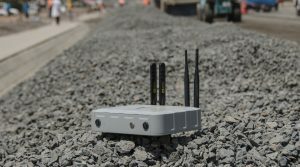 It started as a mobile charging station for small mobile devices and expanded to a provider of free intranet, low cost WIFI and access point to public authority administration services, which are done only online in Rwanda. As a franchise company, ARED intends also to create new jobs and small entrepreneurs across Africa. Henry is a passionate advocate of local and social entrepreneurship, which is for him the evolution of international NGOs. The establishment of such an entrepreneurship in Rwanda is his personal goal and dream. 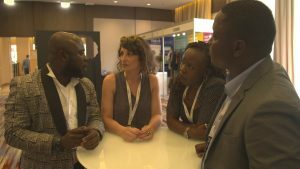 The pan African Tech Summit in Kigali is a tech fair, that brings together the institutions, companies and prominent personalities of the sector. The headline question of the fair was “Why do we still face the challenges we have?”. This is a question that sounds hard, but points right to the question of structural problems within the international and global environment, as well as national challenges and individual problems. But the Summit was also a physical reunion date for a community, which is well connected across the digital borders. 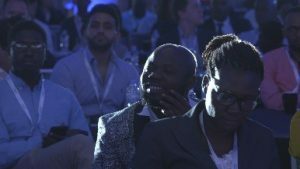 We met a lot of our protagonists at the Summit and spoke to experts of different nationalities about the future of African technology, its significance for the society and the challenges, that are still to overcome. MobiRecs is a project trying to install a national system of electronic health records. It works with the Blockchain technology, that became prominent with the controversial digital currency “Bitcoin”. The blockchain technology, which replaces physical servers with a transparent network of individual computers, is also discussed as a key technology for the future of African digital technology. It makes African content less dependent of servers, that find themselves mostly overseas, in Asia or Europe and is even more safe in terms of power abuse and transparency. The electronic health records are already in use at two hospitals and they are praised by their doctors, who also benefit thanks to the time saving and less struggle with torn paper health records. 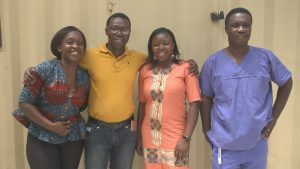 At one of the hospitals, Geraldine generated her own Ghanaian health record and we spoke with the doctors about their experiences with the technology. Rhonda Boateng explained her vision of medical empowerment for the Ghanaian people. Dext is basically a cheap science kit for children, that is used privately or in schools. With the kit, the two founders Charles Ofori Antepim and Michael Asante-Afrifa try to cover the lack of practice material in STEM-classes across the country with a cheap set where kids can experience and explore the basic rules of physics and especially electronics. The kit was invented to educate the next generation of tech specialists and makers, and to make the first steps to science a more easy and exciting experience. We spoke with Charles and Michael about the excitement of exploring physics like a child and how to push this experience in simple ways. 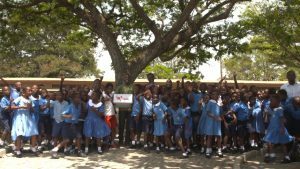 Other topics where the challenges and advantages of the Ghanaian education system. 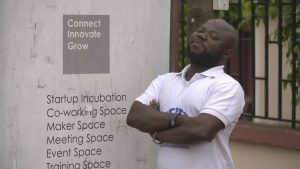 The Kumasi Hive is a makerspace in Kumasi, that is deeply integrated into the Kumasi tech scene, as well as the local production chains and markets. Additional to the usual qualities of a hub and a makerspace, the Hive is involved in strengthening female techies and entrepreneurs, as well as an ecologically sensitive handling of technology. Jorge Appiah, director of the hive, is a prominent and lively funster, who does his best to strengthen the Ghanaian tech community. 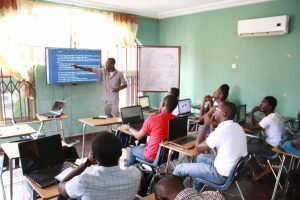 Jorge told us about his view on the future way of African tech solutions and the relationship of the tech community with the public authority of Ghana.